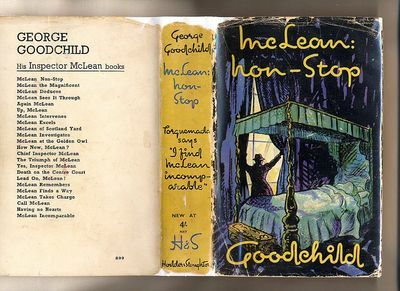 Published by Hodder and Stoughton Ltd., London First Edition 1941. London 1941., 1941. First edition hard back binding in publisher's original powder blue cloth covers, black title and author lettering to the spine. 8vo. 7½'' x 5¼''. Contains 255 printed pages of text. Faint mottling to the boards. Very Good condition book in near Very Good condition dust wrapper with 3 mm chips across the spine ends and corners, rubbing to the edges of the front cover, priced 4/-, yellow spine not faded. Dust wrapper supplied in archive acetate film protection, this preserves and prolongs the life of the paper, it is not adhered to the book or to the dust wrapper. Member of the P.B.F.A.